Favourable autumn grass kept the Nelson/Marlborough rural property market optimistic. Horticulture, meanwhile, is undergoing major growth in the region, with new plantings of apples, hops and grapes. Land values are increasing and, with blocks difficult to come by, competition to secure those that are offered to the market is fierce. Community irrigation providing water for the Waimea Plains would add further impetus. No significant post-harvest sales of Marlborough grape blocks were concluded in autumn. While interest from buyers apparently remains strong, growers took time to assess their returns and were not ready to test the property market. Several Rai Valley dairy farms have changed hands recently at prices ranging from $28,000 to $30,000 per hectare. These values reflect the upturn in the payout projection and the ongoing appetite to enter the dairy industry. After a busy final quarter of 2016, the rest of summer and early autumn were less active. Plenty of late March and April rain freshened up Canterbury, persuading some farmers to offer smaller blocks for sale. Several properties in the Central Plains Water area were listed towards the end of autumn. Reliable irrigation should add a premium to these properties, although it is too soon to say what value the market will place on that. A fully irrigated 222 hectare farm with dependable water consents and rich soils selling at Cust, Waimakariri, will receive close market attention. With the beef schedule positive, finishing farms are well sought after, while the region has had no notable dairy farm sales for some time. This trend is likely to continue through winter then market activity should lift again in spring. Optimism around dairy prospects has yet to reach the West Coast as local cooperative, Westland Milk Products, has so far been unable to reverse its low payout forecast. Nevertheless, there has been recent interest in 50 to 60 hectare run-off properties around Whataroa, Franz Josef and Hokitika, as local farmers consider extending milking platforms. While sales did not transpire during autumn, prices in the range of $13,000 to $14,000 per hectare were indicated. Climatically, one of the region’s best autumns followed one of the worst summers, leaving plenty of cover on West Coast paddocks and cows in good condition. Most farmers are sitting tight, awaiting good news from their local producer, rather than offering property for sale. Any positive signals through winter could result in an upturn in the spring rural property market. Significant activity before that is unlikely. While autumn sales in Mid and South Canterbury were lower in volume than recent years, sales values returned to the record levels last seen just before the 2008 global financial crisis. An Ashburton dairy farm, for example, sold in April for $52,677 per hectare. Sellers buying their next farm characterised market activity, with few cash buyers and finance difficult to obtain. For sale by deadline private treaty in early June, 913 hectare Hakataramea Downs traditionally winters up to 7,500 stock units of deer, cattle and sheep, and includes 250 hectares under gravity-fed irrigation. With the possibility it will attract a large-scale or corporate buyer, its sale should provide a useful market indicator. 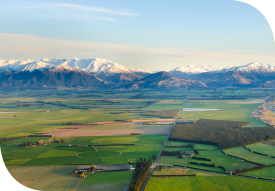 Although the number of currently active buyers is limited, there is scope for more Mid and South Canterbury farms to be offered for sale in spring. A relatively mild autumn was encouraging for Otago farmers, with abundant grass and reassuring prospects going into winter. With commodity prices also rising, several sheep and beef properties were transacted in the region in recent months, including a 176 hectare Tarras property that sold in April for $4.85 million. Other autumn Otago sheep and beef farm sales ranged between $3 million and $5 million, equating to approximately $1,000 per stock unit. Buyers for farms carrying greater than 10,000 stock units are proving more difficult to find and activity in the region’s dairy property sector has been relatively quiet. Coastal Otago forestry sales have been numerous and this market continues to prosper, with excellent results. Listings of all Otago rural property types are in short supply and any farm offered for spring sale is likely to be favourably received by an eager market. Southland’s autumn rural property market showed a significant lift, with the total value of transactions up by around 50 per cent on autumn 2016. Dairy farms are selling again. An 800 hectare Mossburn property, milking around 2,000 cows, was purchased in April by a significant corporate farmer valued around the mid $20,000s per hectare. A series of Gore properties from the Solid Energy portfolio sold through the tender process in March. Values for these sheep and beef farms ranged from $14,000 to $27,000 per hectare for variable sized blocks. Through winter, few Southland dairy farm sales are likely. With recent dairy auction increases, initially at least, the number of dairy farms for sale is likely to reduce as owners hold back until the spring before presenting their properties to a more confident spring market. Those purchasers previously looking for bargains in the region may have missed their chance. For more information, please contact your local sales consultant or local PGG Wrightson Real Estate office.